getcalc.com's Rectangle Calculator is an online basic geometry tool to calculate area, perimeter, diagonal, length or width of a rectangle shape or plane, in both US customary & metric (SI) units. Rectangle is a two dimensional plane or geometric shape with 4 straight sides and 4 right angle (90º) corners. Adjacent sides of a rectangle is unequal and opposite sides are parallel to each other. 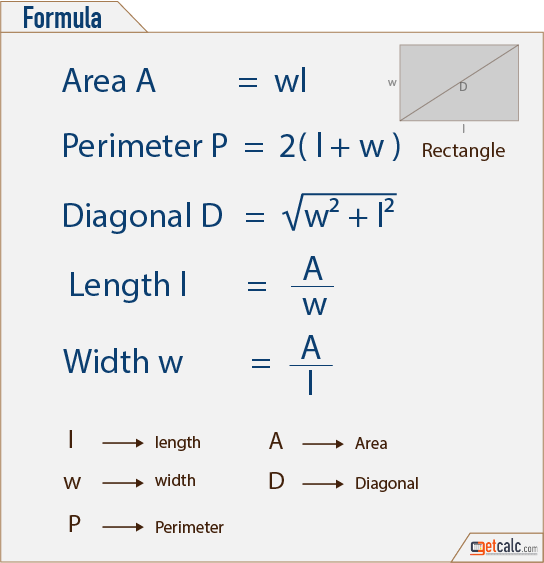 K-12 students may refer the below formulas of rectangle to know what are all the input parameters are being used to find the area, perimeter, diagonal, length or side of a rectangle. Below are the practice problems for grade school students, on finding what is the area, perimeter, diagonal, length or width of a rectangle. By click on the corresponding problem shows the step-by-step calculation or work with steps for how to find the area, perimeter, diagonal, length or side of a rectangle. For any other similar values, use this rectangle calculator to verify the results. Find what is the area of rectangle whose length & breadth measured as 16 and 11 inches respectively? Find what is the area of rectangle, if it has a length of 60 inches and width of 30 inches? Find what is the perimeter of rectangle whose length & breadth measured as 45 and 24 inches respectively? Find what is the perimeter of rectangle, if it has a length of 10 inches and width of 7 inches? Find what is the diagonal length of a rectangle whose length & breadth measured as 60 and 30 inches respectively? Find what is the diagonal length of a rectangle, if it has a length of 7 inches and width of 4 inches? Find what is the length of a rectangle whose area is 1200 square inches and width is 50 inches? Find what is the length of a rectangle, if the area is 2400 square inches and breadth is 40 inches? Find what is the width of a rectangle whose area is 3600 square inches and length is 70 inches? Find what is the breadth of a rectangle, if the area is 5000 square inches and length is 90 inches?